Are you looking for information about Congenital Cardiac Defects? I sure hope so because this study guide is loaded with practice questions that can help you ace your exams in Respiratory Therapy school. A congenital heart defect is basically a problem with the structure of the heart that occurs and is one of the most common birth defects. This is definitely a topic that you will need to be familiar with as a Respiratory Therapy student, especially in the Neonatal/Pediatric courses. So let’s go ahead and dive right in! 1. What affects the pulmonary vascular resistance? Changes in PaO2, PaCO2, and pH. 2. What are the two categories that have typically been used to classify congenital cardiac defects? 3. The patent ductus arterioles connects which two vessels? Aorta to the pulmonary artery. 4. What is the therapeutic goal of sub-ambient oxygen therapy? Increase the pulmonary vascular resistance. 5. The purpose of managing pulmonary vascular resistance in the presence of cardiac defects is to ensure the desired balance between what? Systemic and pulmonary blood flow. 6. Tetralogy of Fallot consists of which 4 concomitant conditions? Right Ventricular hypertrophy, Overriding aorta, Pulmonary Stenosis, and Ventricular septal defect. 7. Increasing gradients between ETCO2 and PaCO2 in patients with congenital cardiac defects are often the result of what? 8. What does the normal human heart have? 4 chambers: 2 atria/2 ventricles. 9. What connects the atria with the ventricles? 10. The outflow from each ventricle contains a valve called what? 11. What is the function of the semilunar valve? It allows blood to flow in only one direction. 12. Blood flow begins with deoxygenated venous blood and goes where? It enters the right atrium from one of 3 sources. 13. How does venous blood enter the right atrium? From organs superior to the heart by superior vena cava. Venous blood from organs inferior to heart via inferior vena cava. Venous blood from the heart itself drains into the RA via the coronary sinus. 14. Blood travels from the right atrium to where? Through the right AV valve (tricuspid valve) and into the right ventricle. 15. From the right ventricle, blood travels through the? Right semilunar valve (pulmonary valve) & into the main pulmonary artery. 16. What are the divisions of the main pulmonary artery? The right and left pulmonary artery, which carries blood to the lungs. 17. The lungs are the site of what? 18. Where is CO2 diffused? 19. Where is oxygen diffused? 20. Oxygenated blood returns to the heart through what? The 4 pulmonary veins that empty into the left atrium. 21. From the left atrium, blood travels through what? The mitral valve and into the left ventricle. 22. Lastly, blood is pumped out of the left ventricle, through the what? Left semilunar valve (aortic valve) and into the aorta. 23. What is the aorta? The main vessel for supplying systemic blood flow to the body. 24. What are the 3 fetal shunts? Ductus Venosus – controls blood flow from placenta back to fetal circulation, back to the liver. Next is the Foramen Ovale – between right and left atria. Last is the Ductus Arteriosus which connects pulmonary artery with the aorta. 25. How does the fetus perform gas exchange during the fetal period of development? The fetus depends on the mother’s lungs for gas exchange. 26. What happens when the lungs inflate, and the beginning of gas exchange begins? PaO2 increases and PaCO2 decreases which contributes to the dilation of the pulmonary vasculature and a resultant reduction in PVR. 27. A reduction in PVR lead to what? Reduced right ventricle pressures and increased pulmonary blood flow. 28. Right atrium pressure decreases when the umbilical cord is? Ligated and no longer provides placental blood flow to the IVC. 29. The Foramen of Ovale closes because of what? Higher left atrium pressures and lower right atrium pressures. 30. When and why does the ductus arteriosus close? It closes shortly after birth, usually within 48 hours. It closes due to decreased concentrations of circulating prostaglandin E2 and an increase in oxygenation. 31. What is left-right shunting? It is when oxygenated blood mixes with deoxygenated blood. Blood from the left heart (atrium/ventricle) or aorta shunts to the right heart (atrium or ventricle) or the pulmonary artery. 32. What is a Patent Ductus Arteriosus? Most common defect seen in the NICU. It can lead to left atrium dilation, left ventricle volume overload (CHF). Preductal/Post ductal PAO2 > 15 difference and SPO2 >5% difference. 33. What is the Atrial Septal Defect (ASD)? Right atrium enlargement and right ventricle volume overload. There is an increase in pulmonary blood flow. It also can lead to an enlarged right ventricle, congestive heart failure, and pulmonary vascular disease. 34. What are the 3 types of ASD? Ostium secundum (most common and easiest repair), Sinus Venosus, and Ostium Primum. Repair is delayed until the child is 3-5 years old and may close spontaneously. 35. What is the Ventricular Septal Defect? May lead to left ventricular volume overload, left atrium enlargement and increased pulmonary blood flow. It will not get bigger but could get smaller over time. 36. What is the atrioventricular septal defect? It is also called atrioventricular canal or endocardial cushion defect. The absence of septa between the atrium and ventricles. It is common in infants with Down’s syndrome. 37. What is aortic stenosis? (1) Subvalvular is a small ring around the valve. (2) Valvular which is the valve itself and is most common. (3) Supravalvular is above the valve. 38. What is coarctation of the aorta? It is severe narrowing of the thoracic aorta near the dilated aorta. Increase afterload to the left ventricle that leads to increased wall tension and myocardial work. Systemic Blood flow is ductal dependent. 39. What is Pulmonic Stenosis? It is a fixed obstruction of the blood from the right ventricle to the pulmonary artery (can involve the pulmonary valve or the pulmonary artery itself). It is a moderate to severe stenosis can lead to right heart failure. 40. What is Hypoplastic Left Heart Syndrome (HLHS)? To maintain systemic blood flow, pulmonary venous blood must flow through the FO to the right atrium. It must have a non-restrictive atrial septal connection, good working right ventricle, PDA, the balance between pulmonary and systemic circulation. ProstaglandinE1 started to immediately ensure PDA. Sub-ambient oxygen can be used to increase PVR (17% to 21% FiO2; target SpO2 70%-80%). 41. What are Cyanotic Congenital Heart lesions? Varying amounts of deoxygenated venous blood are shunted to the left heart, reducing systemic O2 Saturation. 42. What would be seen on a chest x-ray in Tetralogy of Fallot? Boot shape appearance on chest x-ray. 43. What is Tetralogy of Fallot? One of the most common abnormalities. It has 4 components: pulmonary artery stenosis, ventricular septal defect, overriding aorta to the right ventricle hypertrophy. Ductal dependent if pulmonary stenosis is severe. 44. What is the truncus arteriosus? Single artery arises from the ventricles of the heart (supplies all the blood flow for systemic, pulmonary and coronary arteries). Large ventricular septal defect (VSD) allows complete mixing of oxygenated and deoxygenated blood. SpO2 goal 70’s. 45. What would transposition of the great arteries show on a chest x-ray? Egg shape on chest x-ray. 46. What is transposition of the great arteries? The position of the pulmonary artery and aorta are reversed (aorta rises from the right ventricle and the pulmonary artery arises from the left ventricle). Oxygenated pulmonary venous blood passes through the left side of the heart and back to the lungs (never gets to the body). Deoxygenated systemic blood passes through the right side of the heart and out to the body (skips lungs for oxygenation). Survival is dependent on mixing through ASD (atrial septum defects), VSD (ventricular septum defects), PDA(patent ductus arteriosus). 47. What is Pulmonary Atresia? Blood flows out of the right ventricle and is obstructed because of atresia of the Pulmonary valve. Hypertrophied right ventricle. The left side of the heart receives blood from the right side via ASD or PFO (pulmonary blood flow is ductal dependent). The SpO2 goal is 75%. 48. What does positive pressure do? It increases the intrathoracic pressures which decrease systemic venous return to the right atrium. 49. What does an increase intrathoracic pressure do to cardiac output? Increasing levels of positive intrathoracic pressure may decrease CO.
50. How does negative pressure ventilation affect cardiac output? 51. What is the ventricular septal defect and what is it associated with? It is a defect in the ventricular septum, resulting in left-right-shunt. The severity depends on the size. It is the most common congenital heart defect. It is associated with fetal alcohol syndrome. 52. How do you treat the ventricular septal defect? Surgical closure while small defects may close spontaneously. 53. What is the atrial septal defect? It is a defect in the atrial septum, causing left to right shunt. Most commonly ostium secundum. 54. What is a patent ductus arteriosus and what is it associated with? Failure of ductus arteriosus to close, causing left-to-right shunt between the aorta and pulmonary artery. Associated with congenital rubella. 55. What are the complications of PDA? Asymptomatic at birth with continuous ‘machine-like’ murmur. 56. What is the treatment for PDA? 57. What are the 4 complications of tetralogy of fallout and what kind of shunt is it? Pulmonary stenosis, right ventricular hypertrophy, VSD, aorta that overrides VSD, right to left shunt, and cyanosis. 58. What is the characteristic X-ray finding of Tetralogy of Fallout (TOF)? 59. How can the patient alleviate symptoms of TOF? 60. What is transposition of great vessels and what is it associated with? Pulmonary artery arising from left ventricle and aorta arising from right ventricle. Hypertrophy of right ventricle, atrophy of left ventricle. It is associated with maternal diabetes. 61. What is the treatment for transposition? Creation of shunt (i.e. PGE to maintain PDA). Requires surgical repair. 62. 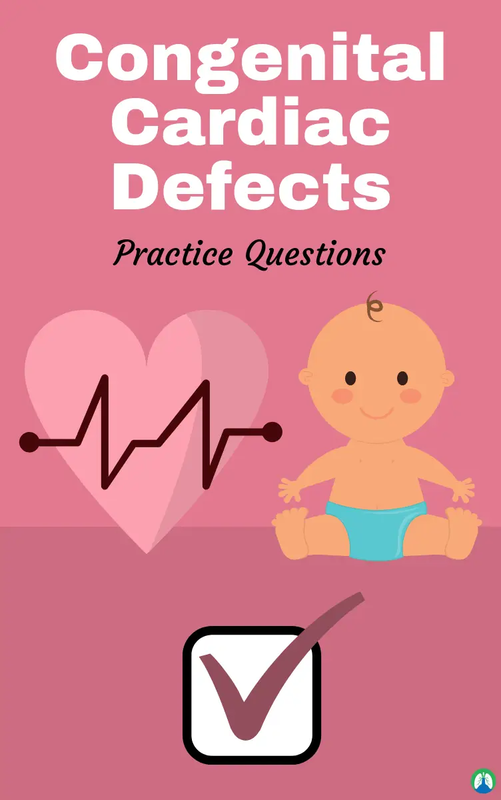 Most defects are due to what steps of abnormal development in the fetal heart? Atrial or ventricles developing, the division of the main outflow to pulmonary trunk and aorta, and development of valves. 63. The fetal heart begins as what? A blood vessel that develops into an enlarged tube with 3 layers: endocardium, myocardium and epicardium, and cardiac jelly. 64. Cardiac jelly is a precursor to what? 65. How many chambers does the fetal heart start with? One atrium and two ventricles. 66. What is the Truncus arteriosus? Single outflow to the pulmonary trunk and aorta in fetal circulation. 67. What is the Septum primum? The superior and inferior endocardial cushions that overlap to create the foramen ovale. 68. What is a Shunt? An abnormal path of blood through the heart or great vessels. 69. Which shunt is cyanotic? 70. What are the two primary pathologies of congenital heart disease? 71. What are the 4 cyanotic congenital defects? Tetralogy of Fallot, Transposition of the Great vessels, Truncus arteriosus, and Tricuspid atresia. 72. What is the abnormal communication between the atria? 73. What are the effects of an ASD on the heart? RThe right atrium and right ventricle enlargement could lead to pulmonary hypertension with a large ASD. 74. What is the amount of shunting in a VSD relies on? Size of the defect and degree of pulmonary vascular resistance. 75. Why is there limited shunting with a small VSD? There is high resistance in the pulmonary vascular system. 76. VSD causes what changes in the heart? Enlargement of the pulmonary artery, left atrium, and left ventricle. 77. How do the pulmonary vessels respond to the VSD? They undergo a structural change to limit the amount of blood entering the lungs, which is irreversible. This raises pulmonary vascular resistance to attempt to decrease the shunting. 78. What is the condition in which pulmonary pressure exceeds systemic pressure which can cause the shunt to reverse? 79. What is the function of the ductus arteriosus in a fetal heart? It allows blood to shunt from the pulmonary artery to the aorta. 80. What should happen after birth to the ductus arteriosus? The lungs expand, and the DA should vasospasm and constrict if not, PDA persists. 81. What direction does the blood shunt in a PDA? Left to right (aorta to pulmonary trunk). 82. What is the coaction of the aorta (COA)? Congenital heart defect where there is a narrowing of the aortic lumen. 83. In a preductal COA, what is the systemic pump? The right ventricle becomes the systemic pump. 84. In a COA, if there is a higher pressure in the aorta, what direction is blood shunting? What are the effects of this? Shunting Left to right, causing increased pulmonary blood volume, straining the left atrium and left ventricle. 85. In a COA, if there is a higher pressure in the pulmonary artery, what direction is blood shunt? What are the effects of this? Right to left, resulting in cyanosis and right ventricle hypertrophy. 86. Pulmonary stenosis causes what effects on the heart? Right ventricle unable to pump as well, causing more blood to remain in the right ventricle, and afterload is increased, right ventricle hypertrophies. 87. What is pulmonary atresia? The worst form of pulmonary stenosis, a complete fusion of commissures. 88. What will happen if there is a severe pulmonary stenosis, the dilation and hypertrophy of the right side? 89. Aortic stenosis causes what effects on the heart? Increased work for the left ventricle, left ventricle hypertrophies, left atrium under more pressure, fluid back up in the pulmonary circuit. 90. What are the 4 defects composing Tetralogy of Fallot? VSD high in the septum, overriding aorta straddling the VSD, pulmonary stenosis, and right ventricle hypertrophy. 91. How does a baby with transposition of the great arteries survive to surgery? They must have another defect that allows some blood to get oxygenated and sent out to systemic circulation (PDA, ASD, VSD). 92. What are the ramifications of a Truncus arteriosus? The truncus arteriosus didn’t divide, so a single vessel from both ventricles sends blood to both circuits. 93. Where does most of the blood tend to go in a truncus arteriosus defect? Most of the blood flows to the pulmonary circulation due to it having a lower pressure. 94. What would be the effect of a pulmonary stenosis with a truncus arteriosus? This could make the lungs higher pressured than the systemic circulation, causing blood flow to go into the aorta. 95. What is tricuspid atresia? An imperforate tricuspid valve that causes no blood flow between the right atrium and right ventricle. 96. For tricuspid atresia to be compatible with life, what other defects must be present? ASD, hypoplastic right ventricle, VSD, PDA (if no right ventricle). 97. What will be the cause of moderate to large ASD? Pulmonary hypertension due to the increase in pulmonary blood flow. 98. What are the effects of a large VSD? Enlarged left atrium, left ventricle, and pulmonary artery. 99. Eisenmenger syndrome can occur with what defect? 100. In a fetus, blood shunts which way through the PDA? How about with an adult? In fetus the shunts from pulmonary to the aorta, while in an adult, it shunts from the aorta to pulmonary. 101. When does Tetralogy of Fallot develop? During the embryonic development of truncus arteriosus and division of the ventricles. 102. What other defects are present in tricuspid atresia? Septal defect, hypoplastic or absent right ventricle, enlarged mitral valve and left ventricle, pulmonary stenosis. And that wraps up our study guide on Congenital Cardiac Defects. I hope these practice questions were helpful for you. Make sure you go through this information again and again until it sticks because you will see this stuff again on your Neonatal/Pediatric exams. Good luck, thanks for reading, and as always, breathe easy my friend.